If you think about it Brian this valve changes the direction of inlet of the steam/air. A slide valve engine has a constant direction of pressure and is only reversed by changing the valve position relative to the crank shaft hence the many forms of 'reversing' gear designed over the years, mainly to improve/enhance the cut off. There was a lovely little inline piston valved twin cylinder model boat engine produced by one of the UK manufacturer at one time. A very neat version of this valve was set between, and integral with, the cylinders giving it a genuine 'forwards to go forward back to go back' capability. (I think that phrase came originally from the old East German DAF car ?) I have no idea who made it - perhaps Jason would know. The other issue with reversing the flow on a slide valve even if you did have the eccentric at 90deg to the crank is that the air/steam would just lift the valve off the port face. 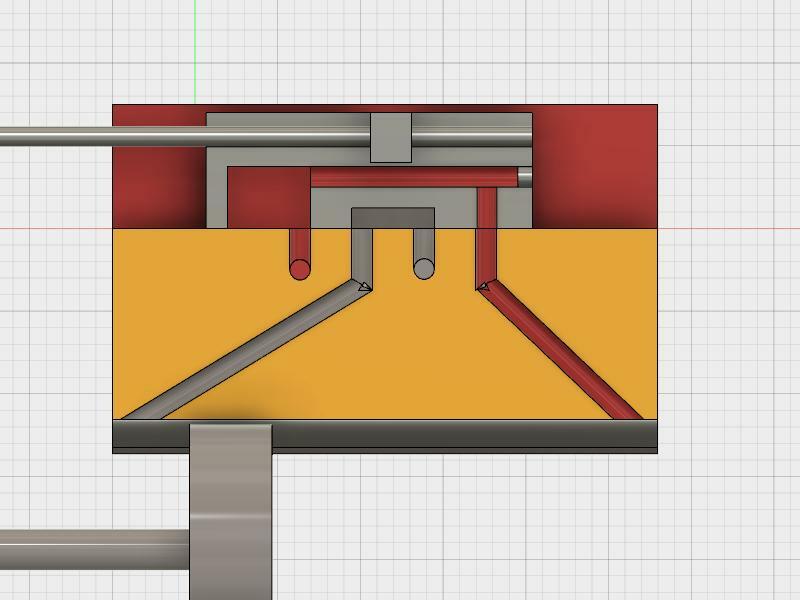 In that pic, the steam is coming in the left hand hole (red in the yellow block) and being directed to the right hand end of the cylinder, pushing the piston left, and the exhaust is directed to the grey hole. Then, in this next pic, the slide valve is moved to the right, putting the steam to the left of the piston, and the exhaust going out the right of the piston. There is steam pressure all around the slide valve, holding it down. When the center valve is in the other direction, steam would be directed to the grey hole and exhaust to the red hole, reversing the direction the piston is pushed. This is not a theoretical thing I thought up, this is actually how the Marion engines worked. Well 'there you go' Chris - just shows that you can learn something every day no matter how old you are You'd have to agree though it's not a 'conventional' slide valve - in model terms that is It would be an interesting challenge to make one. I found a pic earlier of the Perseus engine by Cheddar Models (that is not the engine I was thinking about previously) that apparently has 'slide valves' and a reversing steam/air 'system' set to the side of the cylinders - wonder if that was on a similar principal? Well 'there you go' Chris - just shows you can learn something every day no matter how old you are You'd have to agree though it's not a 'conventional' slide vale - in model terms that is It would be an interesting challenge to make one. I found a pic earlier of the Perseus engine by Cheddar Models (that is not the engine I was thinking about previously) that has 'slide valves' and a reversing system set to the side of the cylinders - wonder if that was on a similar principal? Later on in my Marion shovel build I'll be making 3 of this style engine, for crowd, slew, and steering. The main hoist engine has a conventional d valve. Only way I figured this one out was by studying thier patent on that valving, which fortunately had plenty of cross section views. 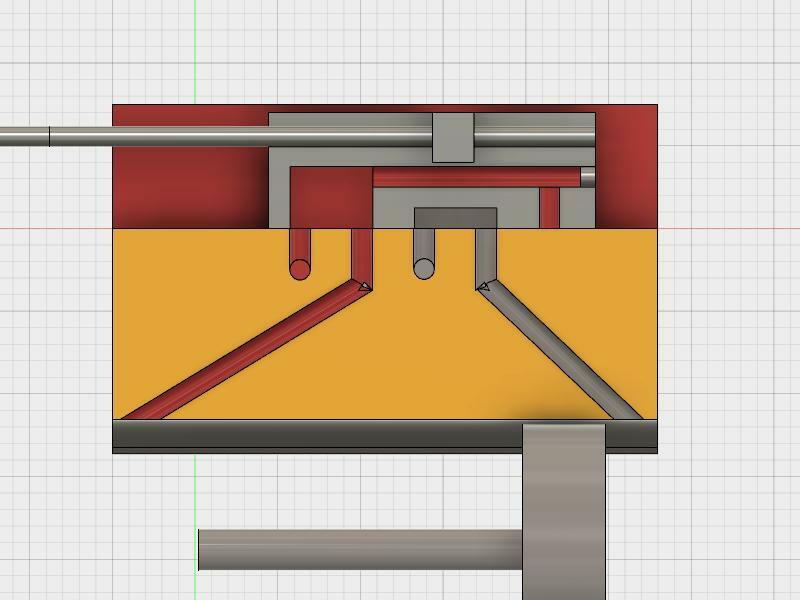 thanks for sharing the drawings on the reversing valve. I have a couple of engines I can use it on. Bad Behavior has blocked 16436 access attempts in the last 7 days.